Our courses are approved by the Delaware Board of Electrical Examiners to satisfy your electrician continuing education requirements. You can find us on the approved provider list as @1st Attempt (tradesmance.com). Complete the continuing education to renew your DE electricians license today. All of our courses can be completed At Your Pace Online to help you meet the state's requirements to maintain your license. Once you finish your class you will have an official certificate of completion to save for your records. 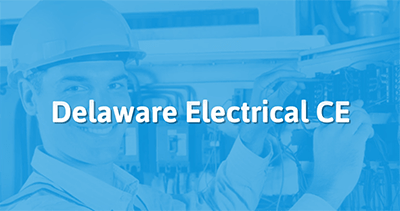 In the state of Delaware, an electrician licensed more than one year but less than two years must complete 5 hours of CE at the first renewal. Beginning with the second renewal, electricians must obtain 10 hours of CE, 5 of which must be related to the National Electrical Code. All 10 hours are permitted to cover the NEC. Proof of CE completion is due by June 30th of every even-numbered year.